Hailing from the clean beaches of Orange County is Vanessa Barnes, a multi-faceted badass who recently released her first original track, "Daddy Like," under the moniker VnssA. Just the beginning of a series of upcoming releases, Barnes plans to show her listeners her sonic diversity having played in bands for years as a drummer prior to her days as a DJ. "I create music for the open-minded individuals and also the like-minded individuals," says Barnes. "My goal is to showcase my different influences and styles with the music I create." "Daddy Like" displays her love of percussion through its emphasis on heavy, pulsating beats as well as its deep house undertones. As a woman in the music industry, Barnes definitely feels an unspoken pressure that seems to linger in the air like the weight of a hot, humid day. "A lot of people think that it is easier being a female -- you get more attention, you get more gigs, you get noticed," Barnes explains. "I have to disagree, though. If anything, I think it is harder. I feel like in order to prove myself I have to not only be as good as the boys, I have to be better." 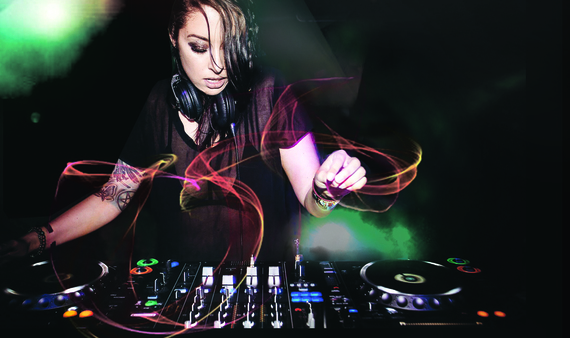 Barnes wants to veer away from the image-based career that many female DJs adopt who rely on their looks more than their music. "I want people to listen to my music with their eyes closed," she jests. As a result, however, she has found inspiration in the many women who have made it in the industry and are currently reshaping these paradigms. "Nina Kravitz, Alison Wonderland, Hannah Wants, Ninth Child, are a few producers/DJs who I love," she says. "Not just for their music but also their positive attitude about being a woman in the music industry." While her career is just beginning, she already has grand plans for her future. With an album in the works, Barnes hopes to go on tour as well as find herself on more festival lineups as she has been diligently applying and making connections in the scene. Having gotten her feet wet on the stages of the Revo Lounge at the Do Lab's Woogie Weekend and Huntington Beach's Sundown Music Festival, she is primped and primed for the flyers of festival lineups. This October, Barnes will be sharing the stage with Gladkill, The Human Experience, and Charles Feelgood at Soultruistic Festival which will surely open doors to future events of this nature. In addition to dreams of tours, festivals, and travel, Barnes hopes to use her music as an instrument for change. Fully aware of the transformative powers of sound, she plans to follow in the footsteps of inspirational activists such as The Polish Ambassador, who spreads his knowledge of permaculture with his music, evoking change one seed at a time. "I plan on sharing and spreading messages and wisdom," Barnes affirms. "I haven't quite figured out how yet but the more I work on myself and my music, the more I'm able to uncover new paths and ways to get my message across. I can only hope that music can open more doors for me as far as getting hands-on on the issues I feel strongly about." There is much to look forward to in VnssA's career as she projects her next single to be released in about two months with a full album following soon after. In addition to the exciting things emerging from the studio, she also plans to revamp her performance game by incorporating live drums, keyboards and more, creating a sonic and visual experience. VnssA does not exist in the world of music because it is her choice, she exists in it because it is her calling.